​Learning Goal: The student will understand the causes, course and consequences of United States westward expansion between 1800-1853. Vote for Orlando's new city flag. 3. Video: "Slavery - Crash Course US History #13"
4. HW: The North. #27. Due tomorrow. See directions below. 3. Due Friday: work on Life in the West mini-Project. Test: Westward Expansion. Tuesday-Thurs, April 11-13. Here is the study guide. All classes will be outside on Thursday and Friday. Dress appropriately for the weather. ***Westward Expansion test on Monday/Tuesday. Here is the study guide. 2. Life in the West Mini-Project. Look in the “Life in the West” unit on TreeOfEd or Chapter 16 in the History Alive! textbook (pages 212-228) to gather information about your group of people. You may use other resources (AHON Ch 13.4, web search, etc.) as well. After the video, reflect on what you have learned about life in 1800 and compare it to what you know about life in modern-day America. Of the 4 topics that you took notes on, pick the one that you think has changed the most from Martha's time period to now. Write (at minimum) a paragraph explaining how this topic has changed. Give specific examples from the video and from modern-day life. 2. Watch The Mexican-American War in 5 Minutes video. Read AHON textbook chapter 10.4, pages 355-359. *Answer question 1ab and 2ab on page 359. *Answer the map master questions a and b on page 356. ​Read AHON textbook chapter 10.4, pages 355-359. Answer question 1ab and 2ab on page 359. Answer the map master questions a and b on page 356. Read the article (in the "FLORIDA" tab) and answer the 5 questions. ​HW: Indian Removal: Read AHON textbook chapter 10.4, pages 355-359. Answer question 1ab and 2ab on page 359. Answer the map master questions a and b on page 356. Spring Break: March 17-26, 2017! Spring Break "HW" Whoever has the highest score after spring break wins a prize. Read the article (in the "FLORIDA" tab) and answer the 5 questions. Finish for HW, if needed. A. Start by reading the introduction page. Then do the Gateway map task on the map that you colored last week. B. If time, go out and explore the Milwee courtyard to find the QR codes. Scan them with an iPad and do the assigned tasks. There are 3 QR Tasks outside; the order of completion do not matter. C. After you finish the above tasks, complete the Legacy wrap-up activity. 4. Louisiana Purchase on tree of ed #18. Scroll down to Task B and answer the 4 questions. 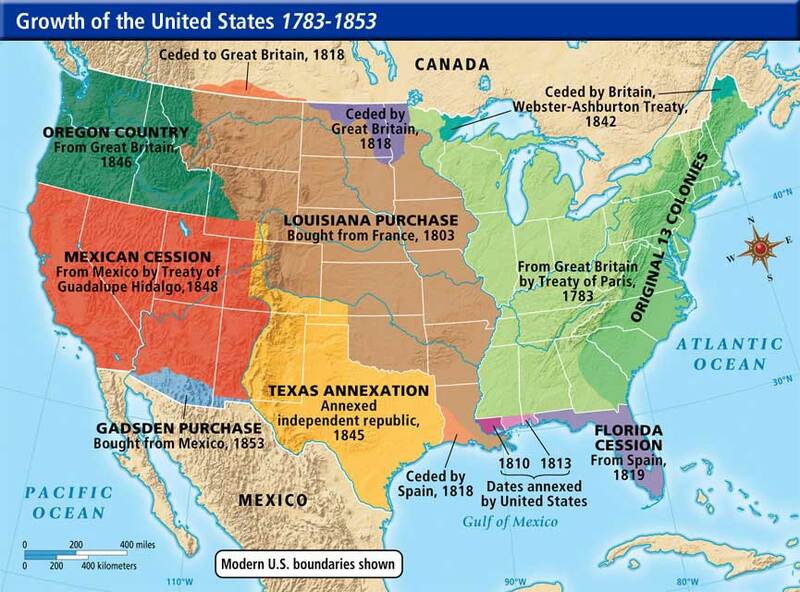 DUE HW: Read AHON textbook Chapter 9.2 "The Louisiana Purchase" pages 314-319. Answer the 5 questions on eCampus. 1. Finish Map: Expansion of the USA, 1607-1853. #19. Color and label the outline map using the completed map below as a guide. Use highlighters or color pencils to color the map. * What can you infer (conclude) from this picture about Americans moving west? (Motivations, consequences, symbols, people, or technology in the painting? 5. 3rd Quarter Exam review on Kahoot. The review is also in the link above. 6. Study for exam or work on Florida and the Adams-Onís Treaty #21. Due Tuesday. 1. Kahoot review for the New Nation test on Monday and Tuesday. Also, here is a study guide. 3. Map: Expansion of the USA, 1607-1853. #16. Color and label the outline map using the completed map below as a guide. Use highlighters or color pencils to color the map.